Low Carb Diet News - Tag Archive for "UK"
Fruit coolers and frappucinos might sound healthy but it seems they aren’t quite as good for you as they claim, after new research revealed that both have more sugar than a Krispy Kreme doughnut. An analysis of some of the most sugary products sold in Britain found that a large red berry ‘fruit cooler’ from Costa Coffee contains 97.1g of sugar, the equivalent to 24 teaspoons. By contrast, a Krispy Kreme original glazed doughnut contains just 7g of sugar – more than 13 times less than the Costa drink. The extreme example comes as a new report brands Britain ‘the fattest country in Europe’ – raising concern about the threat to health from excessive sugar consumption. Around one in four British people are classified as obese, according to the report by investment bank Credit Suisse. The report estimates that obesity and related diseases cost the worldwide healthcare system £372 billion a year. Eight out of 10 doctors in a global survey considered that sugar consumption was linked to the development of obesity and type II diabetes. The recommended maximum daily consumption of added and intrinsic sugars is 90g for a woman and 120g for a man. However, the Credit Suisse report points out that it can be difficult to restrict consumption because some popular daily staples – from Starbucks drinks to muffins – can contain more sugar than several doughnuts. 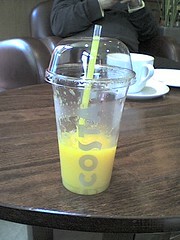 A sample of products revealed that Costa’s fruit cooler contains more sugar than a woman’s recommended daily allowance. One of the reasons for the large quantities of sugar in drinks sold in coffee chains is the big cup sizes.A large drink in Costa Coffee, known as a Massimo, contains 610ml of liquid – more than a pint. A large Starbucks coffee frappuccino (590ml), without whipped cream, contains 61.6g of sugar, equivalent to that found in more than 20 original McVitie’s digestive biscuits. The sugar industry says there is no evidence of any proven link, but some doctors consider the risk to health has been underestimated for years. Aseem Malhotra, a cardiologist and writer, said: ‘Added sugar has no nutritional value and we don’t need it. A report published earlier this year found that sugar consumption was associated with diabetes II. Another, by the Academy of Medical Royal Colleges, called for a 20 per cent increase in the cost of sugary drinks and fewer fast food outlets near schools. A spokesman for Costa Coffee said: ‘Costa takes the nutritional balance of all its food and drink very seriously.